He won six medals in one day, including three gold and two silver medals, at the Third Olympiad, the 1904 St Louis Olympics. This despite his competitors having a leg up on him. Literally. The St Louis Summer Games was the first time medals had been awarded to the top three finishers of an event, and it was also the first time that an athlete had performed with a leg prosthesis. American, George Eyser, had lost his left leg in an accident involving a train, so he ambulated and competed using a wooden leg. At the top of the page is a picture of the prosthesis, which I admit, looks pretty good for early 20th century medical technology. Even so, try to imagine Eyser running fast enough or jump high enough on that wooden leg. Try to imagine him sticking a dismount off of the horizontal bar. I can’t. And yet, he won gold in the parallel bars, long horse vault, as well as the 25-foot rope climbing events, took silver in the pommel horse, and bronze in the horizontal bar. At the least the last activity mentioned didn’t require so much from the legs. It wasn’t until 2008 when the second athlete with a prosthesis for a leg performed in the Olympics – Natalie du Toit, a swimmer from South Africa who competed in the 10 kilometer swimming marathon. 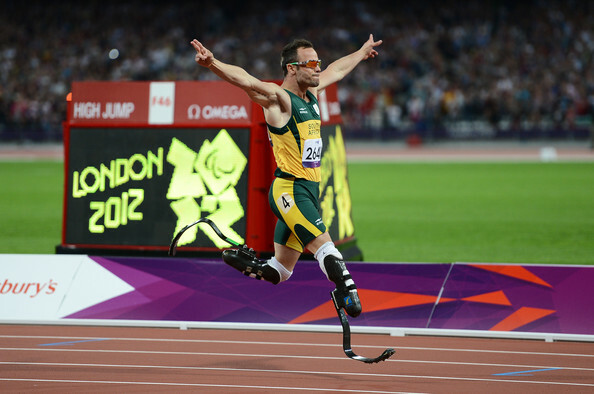 More famously another South African, double-amputee Oscar PistoriusOscar Pistorius, ran in the 400-meter race at the 2012 London Olympics on carbon-fiber prosthetics. Those j-shaped modern engineering miracles and Pistorius’ athletic ability earned the runner the very cool nickname, Blade Runner, once upon a time. It is Eyser alone, of this incredible trio of athletes, who stands firmly as Olympic champion. Posted in Gymnastics, Other Olympics, Paralympics, Swimming and tagged fope climbing, George Eyser, Natalie du Toit, Oscar Pistorius, St Louis Olympics. Bookmark the permalink.